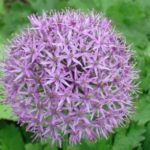 May’s plant of the month is Allium ‘Purple Sensation’. Allium are bulbous herbaceous perennials with a strong onion or garlic scent. ‘Purple Sensation’ grows to 90cm, with short basal leaves dying down by flowering time. Flowers are small and spherical in a vivid rosy-purple. They like a sunny spot in all aspects and prefer moist but well drained soil. They are great in flower borders and beds in cottage and informal gardens and also as cut flowers.